"There's something very strange about this town." Children of the Corn, based on a Stephen King short story, tells the story of Gatlin, Nebraska, an isolated farming community where the children once united and rose up against their elders, murdering all of the town's adults in a bloody massacre. While passing through the area, recent medical school graduate Burt Robeson (Peter Horton) and his girlfriend Vicky (Linda Hamilton) run over a child on the otherwise deserted highway. Burt's panic subsides when he discovers the boy's throat has been slit, but when he and Vicky attempt to report the death, they find themselves targeted by the children's cult, a twisted cornfield religion that serves "He Who Walks Behind the Rows," an unspeakably evil entity. Director Fritz Kiersch discovers unexpected potential in the story's bucolic setting, managing to make sunlit corn waving gently in the wind seem ominous and foreboding. There's something unsettling about Gatlin's isolation and its deserted, stalk-strewn business district, and the film capitalizes on stereotypes of small-town narrow-mindedness and intolerance. The cult's scary but charismatic and impressively creepy young leader Isaac Chroner (John Franklin) is an unsubtle burlesque of the old-school Puritans, wielding deadly power as the sole interpreter of the cornfield demon's word and wishes. Kiersch exercises restraint in the gore department, keeping most of the violence offscreen, though he does resort to a few cheap jolts early on. Unfortunately, the movie's considerable atmosphere can't keep the story alive for ninety minutes. King's thirty-page original didn't have to explain itself in any detail, but the script stretches the narrative out considerably, giving us plenty of time to question its basic premise. If the cornfield cult took control of the town three years ago, murdering the town's only police officer and every "outlander" who has happened by since, why hasn't anyone from the outside world really investigated? Did nobody in the nearest town (about twenty miles away) have ANY friends or relatives in Gatlin? Is there no post office shuttered, no utility bill gone unpaid? How do the kids survive without any contact with the outside world? How many recipes for corn can there possibly be? What's frustrating is that the premise lends itself to many more interesting stories left untold—I'd love to know how Isaac managed so completely to brainwash most of the kids in Gatlin, without any adult concern or apparent notice, or how the impulsive, ill-tempered Malachai (Courtney Gains) became Isaac's sword and "muscle." Moreover, the physical production leaves much to be desired—even the opening credits exhibit visible, rock-steady dirt on the text overlays. Dialogue that may have seemed credible on the page sounds hopelessly ungainly in the mouths of the juvenile actors. Little Sarah (Anne Marie McEvoy), a girl with visionary gifts, always seems about to break down in giggles as soon as the director yells, "Cut!" (an understandable reaction, actually); John Chroner's Isaac has Shakespearean intonation but little emotional power, and Courtney Gains' Malachai seems completely unable to deliver a line past his perpetual, Jagger-esque sneer ("They'ad a gamean'music! They'ahforbi'en!"). Young Robby Kiger gives a more convincing performance as Job, a boy who befriends Burt and Vicky, but he's also stuck with "No way!" and "Excuse me!" lines out of keeping with his character's small-town, religiously conservative background. The adults don't fare much better—Burt's final exams have apparently burned out most of his brain cells, and Vicky spends most of her time as a hapless, screaming victim. I don't want to give away the film's "dramatic" conclusion; suffice it to say that low-budget pyrotechnics, cheesy animation and a burrowing underground presence don't do much to help the climax, which incidentally completely alters King's original ending. 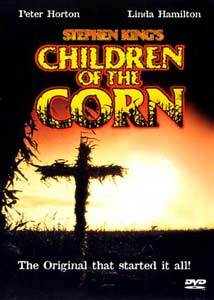 Children of the Corn wants to be a hybrid of Wise Blood and Lord of the Flies, a terrifying examination of isolated young minds deceived and corrupted by religious zealotry, but it's just too silly to pull it off. Call it Manson Family Circus. Image Transfer Review: Once again, Anchor Bay blesses a minor film with a DVD transfer that puts some of the majors' efforts to shame. Children of the Corn is presented in 1.85:1 anamorphic widescreen, preserving the original theatrical aspect ratio. The print has a few flecks and a generally soft look, and the low-budget film suffers from excessive grain in a few darker sequences, but the digital transfer courtesy of Crest National looks just great, with good color and impressive shadow detail in the (often badly underlit) interior shots. It's not a reference-quality transfer, but I can't imagine Children of the Corn looking much better than this. Audio Transfer Review: Children of the Corn on DVD features two audio tracks, its original Dolby 2.0 Surround mix as well as a new 5.1 remix by Chace Digital. The original 2.0 mix is surprisingly active, with a number of dramatic (if gimmicky) rear effects. The electronically engineered 5.1 version splits the surrounds and boosts the bass rumble in several scenes, but it generally retains the centered, front-oriented character of the theatrical presentation. Dialogue (as painful as it occasionally becomes) is clear throughout, and the music stings used to accentuate various "scary" moments sound fine. Nothing spectacular, but no major problems. Extras Review: Anchor Bay's Children of the Corn DVD is light on extras, with 26 text-menu chapter stops, nicely animated menus, and the original theatrical trailer. The trailer is nicely presented in 1.85:1 anamorphic widescreen and 2.0 monophonic audio—it's in decent condition, and rather entertaining, as it makes the film seem even cheesier than it actually is, intercutting its most violent moments with "shocking" grainy blown-up stills. The trailer also features the theatrical poster's memorable image of a raised, scythe-wielding hand against a red background, sadly missing from the DVD packaging. The DVD keepcase also includes a 16-page full-color "collectible booklet" written by Michael Felsher, discussing Stephen King's work and the feature presentation at hand. The booklet features a number of photos from the film, and Felsher's comments are well-considered, acknowledging the film's artistic shortcomings as well as its sequel-spewing box-office success. Children of the Corn remains one of the weaker movies based on the voluminous works of Stephen King, rich in atmosphere but very hard to swallow whole. Still, fans will appreciate the high-quality DVD presentation provided by the eclectic folks at Anchor Bay.